It might be an exaggeration to say I have fallen in love with this suitcase from Thule – but I do love everything about it. First, the colour (a classy dark red), then the size (a sleek 20 x 35 x 55cm) which means it complies with most airlines’ carry-on requirements (we took it on a Ryan Air flight to Alicante as a carry-on with no problems). It’s also strong and sturdy, but lightweight too. And the outer fabric, with its understated sheen, is durable and water-resistant. The case has three handles: a pull-up telescopic handle plus a sturdy fabric handle on the top of the case and another on the side, making it easy to pop up and down from overhead plane and train lockers without falling all over yourself. It has a handy deep outer zip pocket, perfect for popping in your passport, phone etc for ease of access whilst going through security. Capacity-wise, it can take a lot, as you can see from these pictures. My other half managed to squeeze in plenty for a few days away including several changes of clothes, two pairs of shoes, a laptop, tablet, book and headphones. There’s a useful zipped mesh divider panel where you can keep worn, dirty clothes separate. And a compression board which not only serves as another divider but also helps keep your clothes quite neatly pressed – and means you can get a lot more clothes (neatly) crammed into the case. Don’t you just love the snazzy pop of the orange interior, too? The wheels are large and sturdy, helping it glide along floors without too much noise. We’ve taken the case on a few trips so far – on a flight to Alicante, a train trip to Valencia and to good old Centerparcs and it’s still looking as good as new. 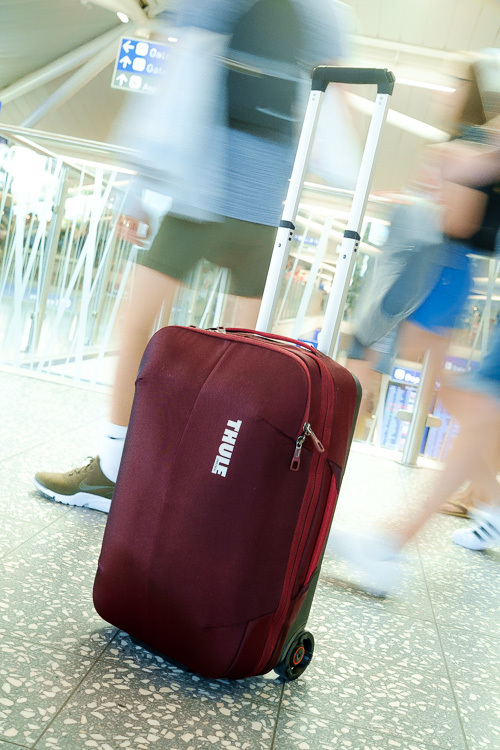 It costs £200 which may seem like a lot, but Thule are well-known for making strongly-built products that last and it should prove a fair investment to make for a case that should see you through plenty of stays-away in style. we certainly couldn’t fault it – both for style and substance.